My baking station – Ikea’s toy containers are great for storing flours, too! When I first started baking in Maine, I didn’t think too much about differences between German and American flours. All-purpose flour was, obviously, your Average Joe among flours. Bread flour was meant for breads. Duh! And whole wheat and rye flours? Stupid question! Exactly the same as German “Vollkornweizen” and “Roggenmehl”. I started wondering about different flour types only, after I had a yearning for German rolls, “Brötchen”, and tried out several recipes. Meanwhile I had learned from Peter Reinhart’s “Bread Baker’s Apprentice” about the merits of slow fermentation, and that steam was needed to create a good crust. My German Brötchen were not that bad, but something, somehow, wasn’t right. The crumb was totally different from what I was used to in Germany. Not kind of loose and fluffy, so that you could easily pull it out, but chewier, with larger pores, more like French bread. After a while it dawned on me that US-wheat has much more protein than European wheat species . The flour contains significantly more gluten, so that the dough has a more stable structure, and breads rise higher. My German-American rolls were suffering from hyper-gluten-ism! In The Fresh Loaf (a forum for hobby bakers) I read later that many Americans, interested in baking German Brötchen, were utterly puzzled by this problem. 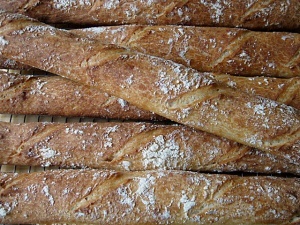 During a visit in Germany, my friend Ingrid asked me to bake those great baguettes I had gushed about on the phone. I went to the supermarket’s baking aisle, and – found myself as clueless as before in Maine! Never having baked breads in Germany, only cakes, muffins and Christmas cookies. I could only imagine that the German all-purpose flour, Weizenmehl Typ 405, wouldn’t be the right thing, and I knew Vollkornweizen (whole wheat). But all the other flour types – what about Typ 550, 1050, 1700? After serious consideration I decided on Typ 1050 – it had to have more gluten than softie flour 405, but the number was far enough from whole wheat flour Typ 1700. So, what happened? My Pains a l’Ancienne turned out much healthier than planned – after all, they contained a good portion of bran. But even though they were flatter and darker than they should have been, they tasted very good. And that was the main thing. *) In Austria there is also another differentiation: the “Griffigkeit” of the flour: griffiges Mehl (Dunst and Feingriess) is coarser than flour, but finer than semolina. You can feel the coarser flour particles between your fingers when you rub it. Doppelgriffiges Mehl (= Dunst) is especially used for fine pastry, pasta and strudel. It has a high content of bran – I would substitute with whole wheat pastry flour or a mixture of pastry/whole wheat pastry. Glattes Mehl (smooth flour) is the equivalent of cake flour. **) Store bought plain flour can strongly vary in quality, and cheap brands may have less than 10% protein. ****) White whole wheat is an albino variety. Dutch flour type equivalents, see here. Whole spelt you may find in supermarkets with a very good selection or in natural food stores. White spelt you need to mail order from specialty stores. In Germany both are more readily available. Most US supermarkets carry only whole rye flour (“Vollkornroggenmehl”), and, sometimes, rye meal, aka pumpernickel, (“Feiner Roggenschrot”). Usually coarser grinds, like rye meal (“Feiner Roggenschrot”), or rye chops (“Grober Roggenschrot”) can be only found at specialty flour stores, or some natural food shops. White rye (a rather bland variety) and medium rye flour you can mail order (King Arthur Flour, NYBakers or Honeyville). Medium rye is very similar to Roggenmehl Typ 1370. It can be mixed with white rye to substitute the lighter Roggenmehl Typ 1150). just love your baking station. you gave nice info about flours. Hi Karin, I think “white rye” is the equivalent to the German “Roggen Type 997”. The kitchen is basically our living room, and I like to have a nice environment when I bake. Lutz, I'm sure you are right. In Germany I only looked what flours they had in the supermarkets. Did you ever bake with it? I found it rather bland. I have heard of German flour, with numbers, but have not seen any of it here. Probably I would have to go to special shops for these, but, like you, I am totally confused! Even reading about the flours are very confusing sometimes! Thank you for sharing the info on flours! If you know which American flours you can use instead, you really don't have to try to find special German flours. 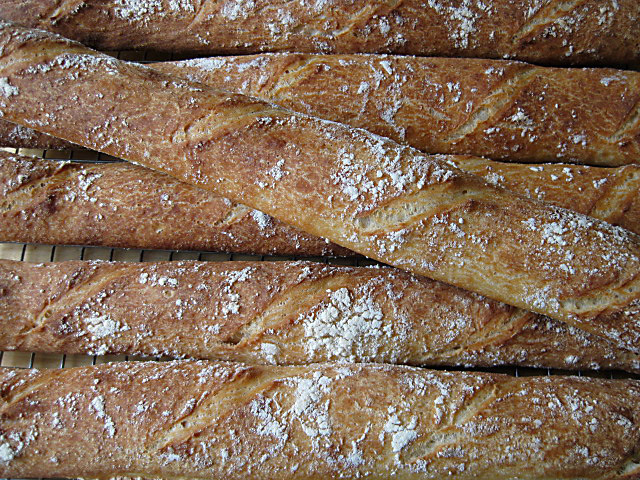 Your bread might taste a little bit different, but not significantly. The only specialty flours you might need for some of the German recipes are (soft wheat) pastry flour (instead of German type 405 or Italian 00) for some typical rolls, and medium rye (German type 1150 and 1370). 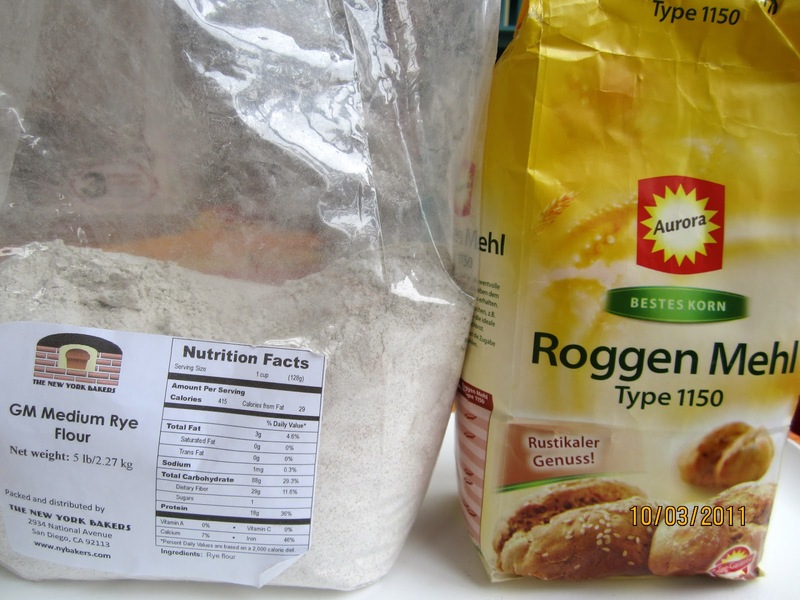 In both of my blogs I will always “translate” the flours from American types to German ones and vice versa. Thank you for this info. Like you, it has been a learning curve for me, to translate recipes from 'across the pond'. My German mother-in-law still craves good brötchen after being here over 50 years, and nothing seems to fit. 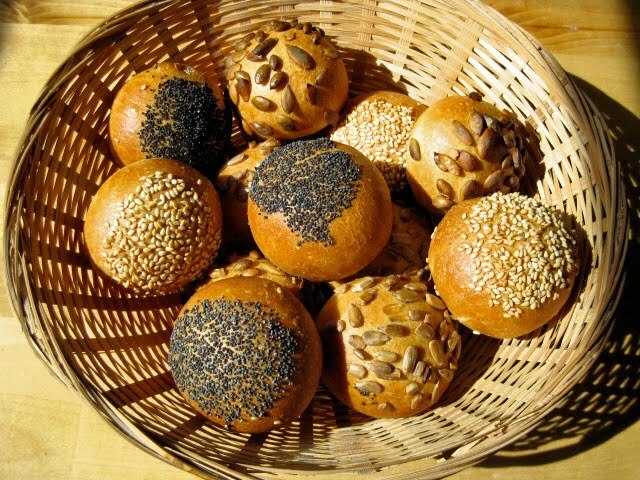 With my interest mostly in wild yeast and whole grains, she is not likely to get much help from me, but if you can succeed in making a decent German bun with what we have available here to work with, I'll be watching with fascination. Mach's gut! You might make your mother-in-law very happy with these – they are the real thing. I added an overnight fermentation to make them taste even better. In the post is a link to BreadLab's very nice video clip on how to make them, too. I usually prefer sourdoughs and whole grain breads, too, but now and then I need just some crackly, crusty Brötchen or other white breads. Yes, it took me quite a while to figure this out, I'm glad I could help you with this. What kind of bread are you baking? Thank you for your wonderful blog! I'm in North Carolina and people here do not know what good bread (or baked goods, in general) are. My husband is from Hagen and my quest for satisfying his desire for true German breads is a passionate one. Your flour translation is excellent information. Incidentally, I made your popovers this morning (using King Arthur AP) and they were a hit! 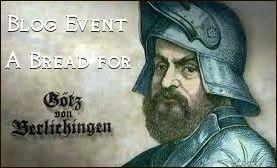 Your brotchen is next! Now…to get that rye flour…. Thank you, Karen, I'm very happy to hear that. It's so frustrating to try a recipe, thinking you did everything right, and then it doesn't turn out right, and you have no idea, why. Good luck with the brötchen, and, please, let me know how you like them! What a marvelous set up – did you create the baking station? Where did you get the furniture piece? THanks! Thanks, Sara! Yes, this is in my home kitchen, and I like things to be functional AND look nice. The furniture – work station and shelves are from Ikea, so are the flour bins – originally meant for storing toys. This works very well for me. Thank you Karin! I was trying to figure out what to use for Austrian 700 griffig to make Apfel Strudel. I will give it a whirl and see where I end up. This was helpful! I'm glad you find my “translation” helpful. Good luck with your Apfel-Strudel – one of my favorite pastries, too! Great information for us transplants. I always got so disappointed when I would make a recipe, I've done many times in Germany and it never would come out as nice. Not that my American family ever noticed, they think all Germans are baking gods…lol. But I knew. I know what you mean, you notice something is off, but have no idea what it may – I had no idea that flours were so different. The flour you mention: “farina integrale di grano tenero” is the (very long) Italian term for whole wheat flour. Unfortunately I can't (or don't know how to) put in a really professional looking table, more so, since the preview always looks a bit different regarding spaces. Thanks for clarifying the name for the Italien wholewheat, it's a very long name indeed…lol…and everybody says we Germans have to long of names for things. Yes, it is. The German Typ 550 is more like an American AP-flour at the high end of the gluten spectrum. Obviously you can get bread flour from Manitoba in Europe, so Manitoba flour is the usual term for American bread flour with more gluten than Typ 550. I buy my organic flours in 50 lb bags, and, depending on what my distributor has available, sometimes the bread flour comes from Manitoba, and sometimes it doesn't – I never saw any difference in its performance. That looks much neater than my unformatted table! Thanks! Or I can give you the code to put in this post, if you like! Yes, I would appreciate that! I think you can just paste it into your post. Katja, can you correct one small error in your table? In the Italian flour column has to be a 00 for the pastry flour (instead of 0). The malted barley flour can be substituted with molasses (use a third less, since it's sweeter and stronger in taste). Thanks so much for this! I bought a book on no-knead bread baking on my last trip to Germany and am now trying to figure out which American flours I can use to make the recipes. Your post answered most of my questions, but I was wondering what you think I could use for the recipes that call for “Roggenschrot (mittelfein gemahlen)”. Thanks in advance! Or you invest in a grain mill (I recommend Mockmill), if you intend to bake with freshly milled flour, or coarser grinds. Unfortunately, rye kernels are too hard to grind in a food processor or coffee mill.